We're moving to a new warehouse and office! This entry was posted on May 25, 2017 by MidMeds. Thanks to the support of our wonderful customers, we've outgrown our current warehouse and office and are moving to a bigger and better premises. Over the bank holiday weekend (26th - 29th May), we will be moving to a new complex in Hertford, Hertfordshire. We hope you're as excited as we are about the move! The new warehouse is much larger than our current one, this means we can stock higher and pass the savings onto customers. We will also be able to increase our already huge range, providing customers with even greater choice. Our new warehouse will feature state-of-the-art technology, so orders will be dispatched faster than ever before! 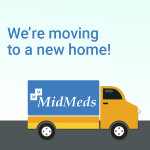 In case you were wondering, don't worry...it's still the same great MidMeds team!